When I started to learn about magic, one thing that came up quite often (usually in the back of magic books), was the mention of the exclusive magic club, The Magic Circle. It’s headquarters in London seemed a million miles away from Hornsea where I grew up. The Magic Circle is based in Euston (down a little back alley that you’d walk right past without realising it was there – the way a secret place should be!) and is the ‘house of 10,000 secrets’. As a teenager I dreamt of one day maybe going to London and The Magic Circle to see a show (I wasn’t exactly sure what The Magic Circle was). At that stage I never thought I’d reach the requirements to actually join. I just wanted to meet all the top magicians I’d read about and maybe see some world class magic in real life. Just to go would have been enough. Fast forward to current day. 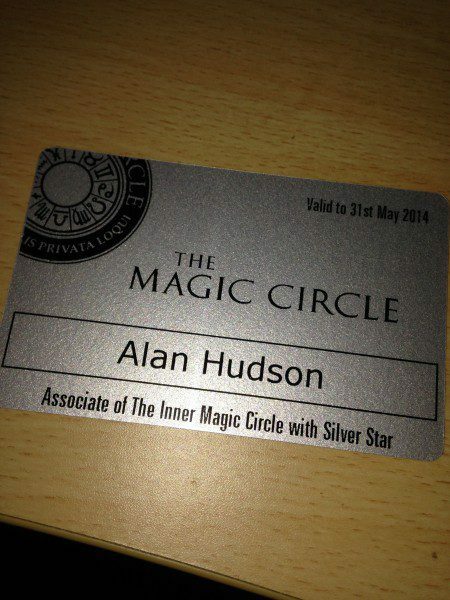 Not only am I a member, this year I got invited to perform my comedy magic act in the flagship show, The Magic Circle X-Mas Show – 2 shows a day to a packed audience for 7 days. As a teenager just seeing the show would have been enough, but to be one of the 4 performers chosen to represent TMC (The Magic Circle) was absolutely mind blowing.